Rotoroa island is a small island off New Zealand’s west coast and was, from 1908 to 2005, home to a Salvation Army’s drug and rehabilitation unit. The facility treated male alcoholics, whilst females in recovery were housed on nearby Pakatoa island. More recently, the kiwi bird is set to be introduced onto the island, as the first of many endangered species given a new lease of life there. We are deliberately aiming not to recreate an ecosystem, but to create an ecosystem anew… We don’t frankly care very much whether those species existed on Rotoroa Island. Rotoroa is not the only island sanctuary, and the idea of a safe haven separated by water from pest and human invasion has often been successful in protecting biodiversity. On the mainland, brown kiwi chicks have only a 3-4% chance of survival, due to the prevalence of invasive mammals. The Rotoroa chicks will be able to use the island as a protective nest, before being released onto the mainland when they have reached maturity and a better chance of defending themselves. So what kind of wildlife will call Rotoroa island home? The Kiwi – small flightless bird, native to New Zealand, it lays the largest egg in relation to its body size. The are five species of kiwi, all of varying levels of vulnerability. They are a shy bird, apparently nocturnal to avoid predators. They have an usually well-developed sense of smell and nostrils can be found at the end of their beaks. They form monogamous couples that can last up to 20 years. 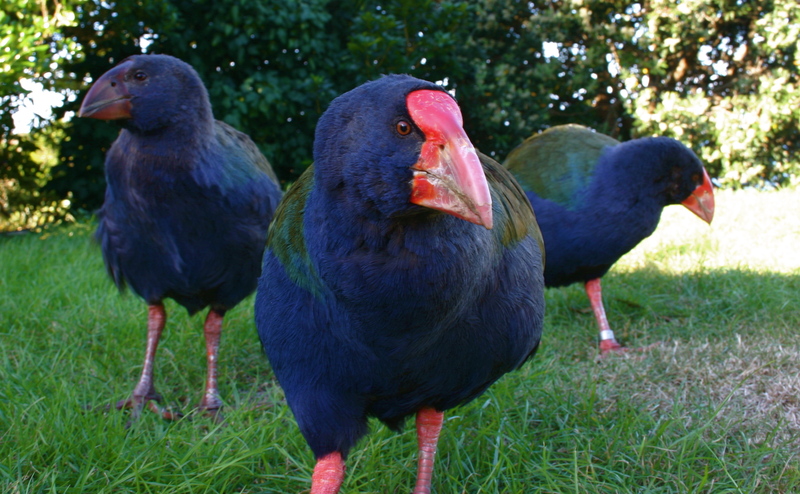 Takahē – looks a bit like a blue chicken. Thought to be extinct in 1898, it was later rediscovered in 1948 after a sustained search effort in the Murchison mountains. The Saddleback – otherwise known as the tieke, this bird is black with a chestnut saddle. They sing at dawn to mark their territory, but can be antagonistic when threatened, causing the birds to fan their tails, bobbed their heads, and even attack their enemies’ wattles. The Maori believed the saddleback’s cry, when coming from the right, was a good omen, whereas when the bird came from the left, it was a bad omen. I appreciate your choice of topics. I live in the U.S. and have the same concerns.